I’ve always felt that we, as proponents of online marketing, should be held accountable to what we teach and preach. But it needs to be done in a way that’s enjoyable, practical, and educational. On a recent trip to New York last week with my wife, I had an epiphany to give myself a 30-day challenge. I would take out 15 minutes every day – and work on a particular online business – build it up from scratch to $1000 in PROFIT by the end of the month. What will actually happen? I have no clue. For this challenge, I’ve decided to go the “Email Business” route because I’ve talked a lot about email marketing, monetization, and even solo ads in the past, especially in my Email Instruments course. Now it’s time to take it to the next level – prove to myself and everyone watching that it IS genuinely possible to start from nothing and create a profitable online business with a few hours of dedicated work. 15 minutes/day x 30 days = ~7 hours. I’ll be completely transparent and I’ve set some hard rules and regulations for the challenge – so I’m 100% accountable. I invite you, implore you, urge you – watch the video, and subscribe to our YouTube channel. The challenge starts July 1st. I’ll be uploading all videos to the YouTube channel and all updates on this page. Share this challenge – let’s get some eyeballs and make this PUBLIC! UPDATE #1: I have never done a live stream before, but today I figured out a way to hook up my iPhone and Mac together with a broadcasting software that lets me share my screen as well. So I have decided to make all 15 minute sprints LIVE. UPDATE #2: To watch all “15 Minute LIVE Sprints” on YouTube – bookmark this page. « How To Create Squeeze Pages That Convert Like WOAH! I hope this will work. Let’s make a try. Have you decided on the actual niche? Not yet Hil. All of that will be done in the sessions. Remember, I’m not allowed to work at all on the business apart from those 15 minute sprints. following you – what software do I need to get ready? I’ll be figuring that out on the fly. For now, all you need is an autoresponder software. That’s bare minimum. I’m so excited. I think this could very well be an answer to my prayers. Blessings. Hey Sandra, I’m humbled. Thank you. Cool! But will you also record all sessions? This is AWESOME! Exactly what I need. I have been studying OptinLabs and InboxBlueprint but I really need to watch over the shoulder of someone doing the first 30 days. It’s the daily stuff I am struggling to follow. Hey Tony, thanks. Yeah – this is pretty much as over-the-shoulder as it can get. See you there. But 15mins a day to make $1k a month does sound unbelievable! I will literally be glued to my screen all through the bizathon. Thanks. Hey Akan, I know right? TBH, I have NO idea if it will be successful – only one way to find out. 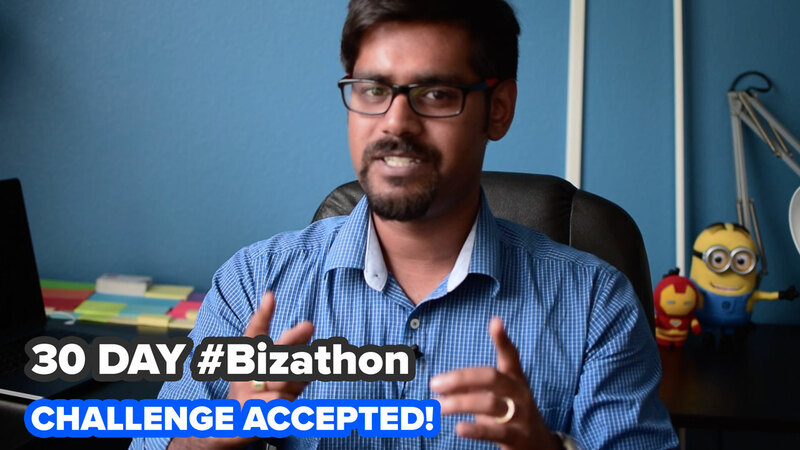 #Bizathon baby! You had said in one your videos that you will be using software already pre-loaded on your PC. Pls let us know what these softwares are and whether we also need to have it in case we follow you. Thanks. Will be glued to your sessions! Hey Rose, thank you for your comment. So in this case, the giveaway IS the pre-sell page. They opt-in to see the “napkin sketch” and that’s what we show them on the Thank You page. Goes to show – you don’t ALWAYS need a free report or video to give away for an opt-in page. We’ll soon find out the numbers on this. The minimum you’ll need is an autoresponder software. The one we use for this Challenge is Sendlane. Now, it is already end of July. Could I still take up this challenge? How would it work for me if I am at the fag end? Of course Sampath – all my recordings are publicly available. You can start the day #1 and keep proceeding. Hi Rito, I would like to promote the 30 day challenge as an affiliate to build my email list. If I use my domain and /eforemail, (http://www.actwritepoetry.online/eforemail) how would I link what is done in the life training to link prospects to me? I plan to use solo ads that you recommend. HELP! I don’t have an affiliate program for the 30-day challenge per say. But I will be rolling out an affiliate program for The DOer Club (which includes the #Bizathon Courses). If you’re intending to use Solo ads, then send your traffic to an opt-in page (your own optin page) to build your list. once a person opts in, send them to The DOer Club VSL using your affiliate link.